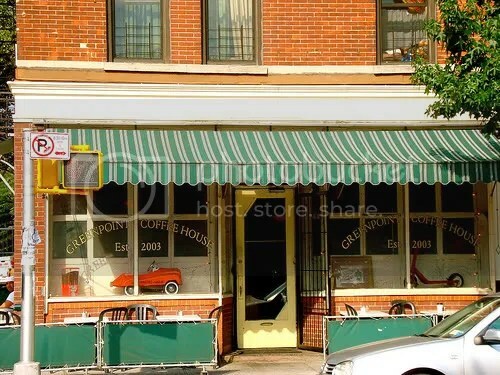 Greenpoint Coffee House is located where you would expect, in Greenpoint, not too far of a walk from the Greenpoint Ave G Train stop. It actually took us a while to make it to this spot, because while it has a vintage look the clientèle appeared to be pretty hip. I’m not afraid or intimidated of hip people by any means (maybe I’m hip who knows), but I don’t want to sacrifice service or quality for hipness. This is not the case a Greenpoint Coffee. Their wait staff is great! Really friendly and welcoming! We have gone the past two Saturday morning, and been able to get a table immediately (even though it has been busy). The inside is a has cute decor, like I said with a vintage feel. There are some chairs up against the wall where the door is, small tables in the middle, booths on one side, and a long bar on the other. 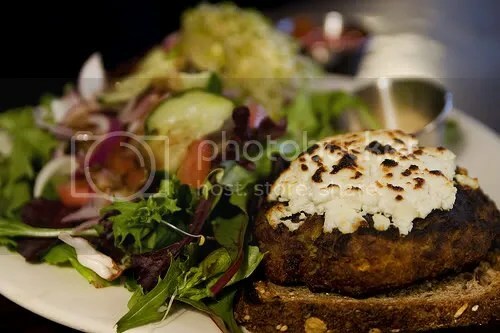 We have only really tried two dishes: I have been obsessed with the Veggie Burger. It’s homemade, and served with your cheese of choice (if you want it to be…I have gotten it with the Goat Cheese once, and Blue cheese the other time), and avocado mayo…just wonderful. KLK has gotten the Eggs Acme…which is perfectly poached eggs on English muffins, with smoked salmon from Greenpoint’s own Acme Smoked Fish! Some of the best smoked fish I have ever tasted…and I don’t even like smoked fish other than sushi. Their breakfast potatos are delicious as well (and I usually find this type of thing bland). They also have a nice tea list, and reasonably priced coffee drinks…highly recommended. Mimosas and Brooklyn beer on tap too (three different varieties) if you are in the mood If it’s nice, sit outside and enjoy beautiful Franklin Street. I can’t wait to eat there tomorrow (almost as excited about it as I am for Built to Spill tonight! ), but I think we will dine inside (too bad it’s raining all weekend). if you’re really worried, print this thread and bring it to the door. we’ll make sure you and your date get in even if it’s tight. I hear alot of people talk trash about Todd P, but I thought this was super nice. I enjoy going to his shows, and I’m just using this as a way to say thank you! Although we got in without a problem the show did sell out really fast. Mount Eerie was amazing, as always. Oreo Fuchi’s Election Coverage 2008!